The obvious choice for us and faultless service. As a family we prefer to support local family businesses so Caldecott & Sons was the obvious choice for us. They supplied cars and made all the arrangements including catering and flowers with all the specific details we requested. On the day the service was faultless. What could have been an unbearably difficult day was a day we were all able to cope with thanks to the dignity and sensitivity of the staff at Caldecott’s. Everything was 5* and the account was very reasonable. We recommend them without question. This entry was posted in Testimonials on April 1, 2019 by stephen. Our first funeral and we did not know where to begin. Caldecott & Sons guided us through from our first introduction in a professional, sensitive and caring manner. They were always on hand to offer support and we felt we were in safe hands from beginning to end. We would highly recommend them without hesitation. From initial contact you know you are dealing we a company with a wealth of experience and attention to detail. Caldecotts are so professional, superb service. Extremely professional, from our first meeting with Stephen to receiving my husband’s ashes, their attention to detail was second to none. We were guided through every stage which made the whole process easy to understand. We would highly recommend. For the fourth time I have used the services Steve Caldecott supplies. Each time he has gone out of his way to make the process as easy for me as possible. Every contact he made was thoughtful , kind and very professional, covering everything I needed to know. At the same time he gave me a full range of choices without making the experience bewildering. At the funeral services and cremations he made sure that the arrangements went smoothly leaving sufficient time to speak to most of those who attended, without making anything seem rushed. Steve and his family live locally in Wrexham and during the whole process I felt I had a friend to guide me. Where do I start, from the first contact I felt that I was in good hands. This was the first funeral I’ve ever had to arrange, and on my own, but I felt that the whole family team at Caldecotts were supporting me right from the start. They guided me through everything with great sensitivity. Amazing communication and nothing left to chance. On the day I felt well supported and also in no doubt that the day would go smoothly, leaving me to remember dad and focus on remembering him. I can highly recommend their service. Thank you to the whole team. This entry was posted in Testimonials on October 3, 2018 by stephen. This entry was posted in Testimonials on September 28, 2018 by stephen. 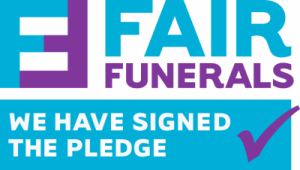 We have signed the Fair Funerals Pledge to show our prices and lowest cost funeral service on-line. This entry was posted in News on September 26, 2018 by stephen. From the first meeting with Stephen Caldecott we were put at ease. Stephen with his experience was able to suggest things that worked so well on the day but also were encouraged to be fully involved with the planning. All along they showed us kindness and support and were so professional. We would recommend them to friends. This entry was posted in Testimonials on September 26, 2018 by stephen. I was having a bit of a bad time and needed some personalised and friendly help. Caldecotts were there for me when I needed them the most and were more than happy to handle everything regarding the funeral for me. I couldn’t thank them enough for what they’ve done for myself and my family and I highly recommend their courteous services to everyone. We are a locally owned and fully independent family funeral directors. Our strength is our small size, which enables us to focus entirely on our clients and to offer a unique personal service. We take everything at your pace and will tailor a funeral to your exact wishes and needs.